The most recent release from Census 2016 Profile 2 – Population Distribution and Movements contains data on the age categories of the population by county. Different age groups have different needs and opportunities so this information is important for planning services for the future and understanding social and economic development issues for our region. The key age categories for analysis are shown in Figure 1 for the Western Region, the Rest of State and for the EU28 (in 2015) along with the projected age structure for the EU 28 in 2080. The Western Region has 21.1% of its population in the 0-14 age group (the same as the Rest of State), while 15.6% of the EU28 population is in that age category. The county with highest share of young people in its total population in 2016 was Donegal (22.0%) while the lowest were Mayo and Sligo (20.3%). The category ‘15-64 years’ covers most of the economically active population. In the Western Region the Galway has the largest proportion in this category (65.6%) but this is still lower than the average for the Rest of State (65.9%). Leitrim has the lowest proportion in this age category (61.5%). There is significant variation among counties in the proportion of the population over 65 years, but all counties have more people in this category (between 13.6% in Galway and 17.5% in Mayo) than the Rest of State (13.0%). Counties, including those such as Mayo, Roscommon and Leitrim which we consider to have high concentrations of older people, have fewer in the older age categories than the EU 28 (18.9%) which is turn is much less than that projected for the EU 28 (28.7%) by 2080. 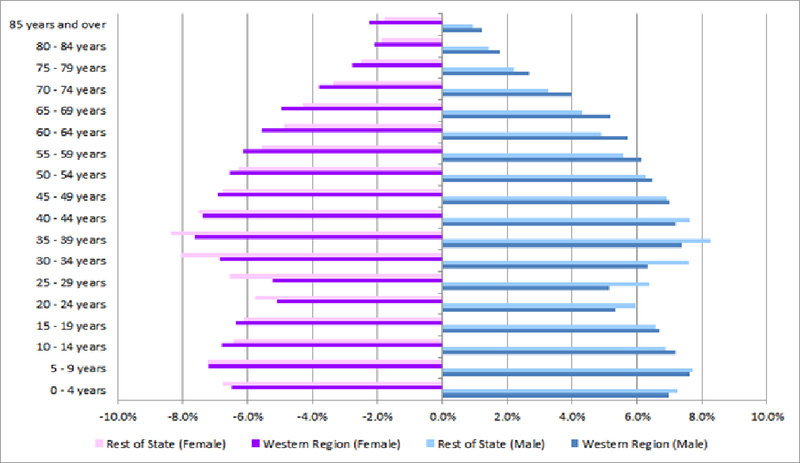 The population pyramid below (Figure 2) shows the age distribution for the Western Region and the Rest of State in more detail. A peak of births in 1980 shows up in the 35-39 age category, and another peak in the number of births occurred in 2009 and shows up in the 5-9 age category. The smaller numbers in both the 20-24 age category relates to a falling birth rate in that period while the lower number in the 25-29 age categories, and to some extent in the 30-34 are the result of high outward migration. The difference in proportions in these age categories for the Western Region and Rest of State indicate greater out migration from the Western Region. The Western Region has a higher proportion of it population than the Rest of State in each of the age categories from 45 years and upwards for females and 40 years and upwards for males. This is also the case for the 10-14 and 15-19 years categories but the more recent higher birth rate in other more rapidly growing counties (especially those surrounding Dublin) means there is a higher proportion of young children in the population in the Rest of State than the Western Region, but these differences are relatively small at the moment. The Dependency ratio (Figure 3) shows the number of older and younger people compared to the working age population (which for this statistic is considered to be 15-64) as these are potentially the most economically active. In reality many in the 15-19 and 20-24 categories will be in education but it is a useful statistic for comparison purposes. It is also important to be aware of the differences in population structure among regions and counties when examining economic statistics such as those for income and output. Counties a lower percentage in the economically active age groups have proportionally more dependents. They will tend to have lower per capita income and output levels even where there is no difference in productivity. Mayo has the highest old age dependency ratio (28.3%) in the country, followed by Leitrim (27.4%) and Roscommon (26.8%) while the lowest nationally is in Kildare (15%). 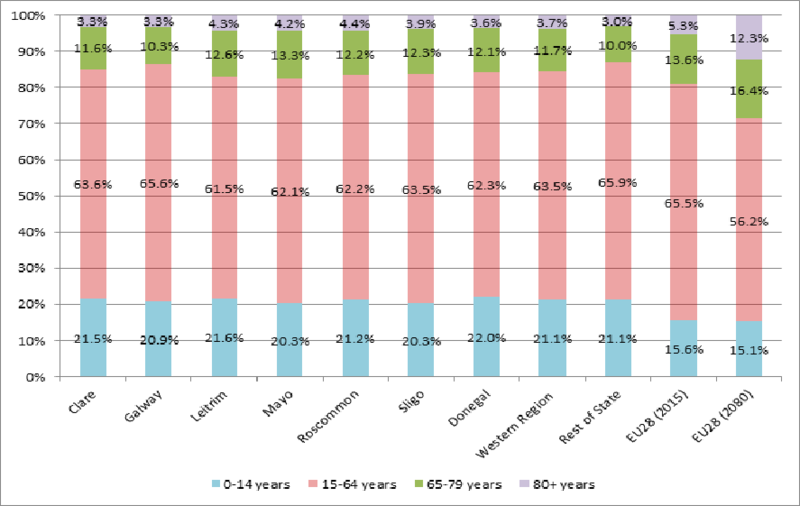 Galway (20.6%) and Clare (23.4%) have the lowest age dependency ratios in the Region but all Western Region counties have a higher age dependency than that for the Rest of State (19.7%). 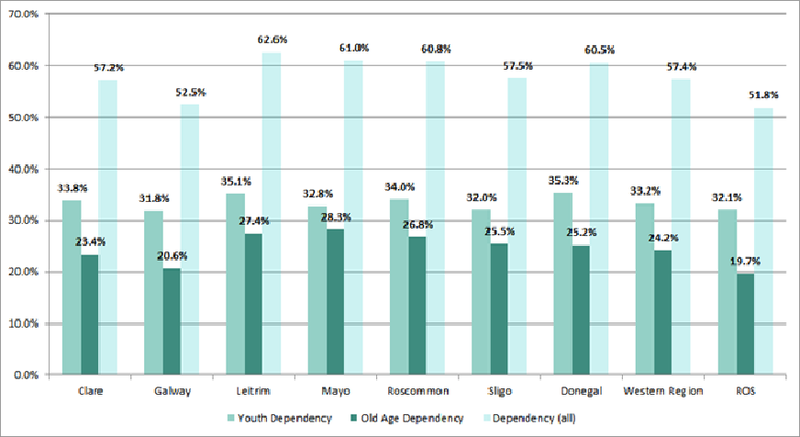 The highest youth dependency ratio in the Region is in Donegal (35.3%) and Leitrim (35.1%) but other counties with particularly high birth rates have much higher youth dependency ratios (in Meath it is 39%, Laois 38.3% and Longford 37.2%). In the Western Region the lowest is in Galway (31.8%) and Sligo (32.0%). The Western Region as a whole has a youth dependency ratio of 33.2% compared to 32.1% in the Rest of State. Combining the youth and old age figures gives an overall dependency figure which gives the proportion of both older and younger people compared to the working age population. In the Western Region this was 57.4% while in the Rest of the State it was 51.8%. This compared to a figure of 52.6% in the EU 28 in 2015. Some of the most significant change is population structure is occurring among the ‘older old’, those in the 80+ years category, with increased longevity and ageing of the older population. In Roscommon 4.4% of the population is already in this older age category, while Leitrim (4.27%) and Mayo (4.24%) are the next highest in the state. In contrast, in Kildare only 1.91% are in this category while in Meath it is 2.21%. Some 3.7% of the WR population is over 80 (3.0% in the Rest of State). It is expected that by 2080 in the EU28 12.3% of the population will be over 80, which compares to 5.3% in the EU28 in 2015. The percentage in the 80+ years category is rising in all counties and, while increased longevity is a significant human achievement, it can have important implications. Those in this age group can experience more poverty and social isolation and poorer health that the ‘younger old’. There is also a significant gender dimension with women having higher survivorship and a lower propensity to re-marry which means they are more likely to live alone. It is important to respond to, and plan for, the needs of this age category and to endeavour to ensure that as many years as possible are lived with as good health and quality of life as possible. A higher proportion of the Western Region population is in the older and younger age categories than in the Rest of State, in part reflecting the outward migration of those of working age. It highlights the importance of a focus on regional employment provision as a key element of regional development policies. Improving employment prospects would benefit those currently in the youth dependent category, as well as those who are already economically active. The higher proportion of older people in many Western Region counties means that services for older people are crucial. As much of the Region is very rural we should continue to learn from best practice elsewhere, particularly in Europe, where the ageing of the population is taking place earlier, on how to provide supports and services to an older population in rural areas. While much of the thinking about ageing populations is on services and supports it should also be remembered that many people in this age category are likely to continue in employment and so this group would also benefit from improved employment opportunities. Currently, 4.5% of the Western Region labour force is over 65, while 13% of those in the 65+ category are in the labour force. This compares to 2.8% of the rest of State labour force over 65 and a 10% participation rate for that age category. Understanding trends in population and examining the detail for the seven Western Region counties helps us better understand the economy and society of the Region. We will continue to provide analysis of the issues as more results are released from the 2016 Census of Population. Rest of State refers to the 19 counties which are not in the Western Region and is used for comparison rather than using a State figures which also include the Western Region. So much data. So little time. Feeling overwhelmed by all the data and analytics from your social media and website? How can you tell who’s genuinely interested and who’s just browsing? How do you know if your online promotion and paid posts/tweets are effective? The Western Development Commission (WDC), through ‘a creative momentum project’, is organising a free seminar in Castlebar at 9.30 on Tuesday, 29 November to try to answer some of these questions. ‘So much data. So little time: Using your online data to grow your creative enterprise’ is open to anyone working in the creative industries sector including arts, crafts, design and media & technology. Visit www.MyCreativeEdge.eu for more information. This half-day event will include expert presentations, business stories and an interactive workshop. Kevin Neary of Connectors Marketplace is among the speakers. Modern buyers are socially connected, digitally driven and very mobile. Kevin will show how creative enterprises can identify and engage with the modern buyer. Joanne Casey of Belfast-based GlowMetrics will discuss developing a digital marketing strategy suited to your creative business. She will also run a Google Analytics workshop on setting goals to measure your digital activity. Two West of Ireland creative enterprises with a strong digital presence will share their experiences. Dina Coughlan of Leitrim-based Tremolo Music Publishing will show how they connect with and sell to clients worldwide. While Ainslie Peters of Galway’s Nádhúra design will outline the experience of a business providing customisable furniture and bespoke design services. Nádhúra are one of the companies who have previously received a WDC Micro-Loan: Creative Industries. a creative momentum project is co-funded by the EU Interreg Northern Periphery & Arctic (NPA) Programme 2014-2020. It supports the development of the creative industries sector in five countries across Europe’s Northern Edge. The project operates the www.MyCreativeEdge.eu website and in the West of Ireland is implemented by the WDC and NUI Galway. https://www.wdc.ie/wp-content/uploads/So-much-data.-So-little-time_CreativeExchange_FB.jpg 513 979 WDC https://www.wdc.ie/wp-content/uploads/wdc-567.png WDC2016-11-17 14:18:292016-11-17 14:19:49So much data. So little time. In a previous blog, I outlined our analysis of the data for the Western Region. In this blog the focus will be on the analysis at county level. It should be noted that in this CSO dataset, enterprises are assigned to the county where they are registered with the Revenue Commissioners. A business with multiple locations (e.g. chain stores, multinationals) is counted once. Although this limits the data somewhat, and tends to increase the numbers for Dublin, it is a good reflection of local business activity. There were a total of 40,797 active enterprises in the Western Region in 2014. Galway had the highest number at just over 13,000, while there were 1,750 registered in Leitrim (Table 1). All western counties experienced a decline in enterprise numbers between 2008 and 2014 that was greater than the national average (-2.4%). At -13.4% Donegal had the second highest decline in Ireland (after Monaghan). Not surprisingly, the sector which declined most in all counties was Construction. Wholesale & Retail also declined across all counties and most strongly in Donegal and Clare – possibly influenced by their proximity to other large retail centres. Accommodation & Food Service declined across most counties, especially Clare. Combined with a large decline in Transportation & Storage, this may be due to reduced flights into Shannon airport. In general the knowledge services sectors performed best. ICT, professional and financial services grew strongly in all counties (with only Clare having a decline in ICT services). Despite this growth however, these sectors continue to play a relatively small role in the enterprise base of most western counties. Construction and Wholesale & Retail are the largest enterprise sectors in every county (Fig. 1). In the highly rural counties of Roscommon, Mayo and Donegal 34-36% of enterprises are in the traditional sectors of Industry and Construction, while in the more urban counties of Clare and Sligo it is around 30%. In Donegal and Leitrim over 40% of enterprises are in the local services of retail, accommodation and transport which rely on domestic spending and tourism. These activities play a key role in the enterprise base of all counties, though Galway’s more diverse enterprise mix means it is least reliant on them. Galway city and Sligo town are strong regional centres for knowledge service firms and this is clear from the quite high shares of their enterprises in professional, financial and ICT services. In contrast, these sectors account for only 17% of registered enterprises in Roscommon. A few examples of particular sectoral enterprise strengths stand out, such as Administration & Support Services in Clare which includes aircraft leasing activities around Shannon and Information & Communications and Financial & Insurance in Galway. Construction remains hugely important to the enterprise profile of the largely rural counties of Roscommon and Mayo. There is considerable variation across the seven western counties in terms of their enterprise base. In general, counties with a higher share of their population living in urban centres (Galway, Clare and Sligo) tend to have a greater share of knowledge services firms and lower reliance on traditional sectors. The general pattern since 2008 has been one of growth in knowledge services but decline in Construction and local services, a similar pattern to employment trends. This pattern has a spatial impact as the former tend to concentrate in urban areas while the latter are more important to rural economies. It excludes Agriculture, Health, Public Administration and Other Services, as well as activities of holding companies. It includes data on Education but this is not counted in ‘total business economy’ as many of the enterprises are publicly owned and is not analysed here. Infrastructure Priorities: What to Invest in and Where? Though the media attention is now largely focussed on what is in Budget 2017 and how it affects individuals, an interesting conference on investment in Ireland’s infrastructure took place on 27th September. Infrastructure Ireland, organised by Eolas, convened a range of speakers with expertise across various Government departments as well as industry bodies and funding agencies. and the sectoral delivery of infrastructure investment and its impacts. Mr. Robert Watt, Secretary General, Department of Public Expenditure and Reform, outlined the current planned priorities for infrastructure investment and how it is spread across different sectors. He noted that there needs to be a debate about what are the key priorities for future investment. There are recognised deficiencies in some areas such as water infrastructure and education. The findings from Census 2016 should also help inform where investment is needed. Mr. Watt argued that capital investment is an enabler of sustainable long-term growth and should not be seen as a driver, in terms of construction industry investment for example. Finally Mr. Watt noted the potential importance of the new National Planning Framework in guiding investment. There is to be a mid-term review of the Capital Plan in 2017 and there should be more long-term strategic infrastructure planning. Danny McCoy, Chief Executive of Ibec discussed the importance of infrastructure investment as a key driver of sustainable economic growth. He argued that the potential growth rate is actually greater than generally considered but that infrastructural deficits will impede or constrain this potential. He also argued that there is a false narrative that as a country we have no money to invest. Our debt to GDP ratio has been dramatically reduced and there are plenty of institutional funding agencies willing to invest in projects (Some examples were outlined by other speakers, see below). Mr.McCoy argued that Ireland is in danger of becoming a society of ‘private affluence and public squalor’, a phrase coined by the economist JK Galbraith. Our public infrastructure stock is being diminished while private wealthy in increasing. For an economy to function well it needs good public infrastructure. Mr. McCoy argued that greater investment is needed in the road infrastructure and not on the radial routes to and from Dublin. Growth is skewed too much towards Dublin with it accounting for 40% of national output. London is seen as an outlier with 22% of the UK’s output, most European capitals account for less than 20% of their national output. The other urban centres in Ireland need to be supported in their growth. He also noted that infrastructure such as further development of our road network, is also a social benefit and the social use of infrastructure should also be valued and highlighted. Addressing Ireland’s infrastructure gap, Tom Parlon, Director General, Construction Industry Federation, also took up the theme of the concentration of economic activity in the Dublin region, agreeing that it is unhealthy for the national economy for so much to be concentrated in Dublin. A key infrastructure project that should have proceeded is the Cork-Limerick motorway, with benefits outweighing costs by a factor of 2:1. Mr. Parlon suggested there should be consideration of an Infrastructure Commission which could properly evaluate the infrastructure needs over the longer-term. Mr. Parlon also suggested that the new National Planning Framework should actively support the development of the urban centres of Galway, Limerick and Cork among others so as to distribute economic activity across the state. There were a series of presentations on the various funding mechanisms which can be considered. Brian Murphy, Chief Executive of the National Development Finance Agency, discussed the future outlook for the PPP (public private partnership) market in Ireland. He outlined the recent successes of this model in funding a range of infrastructure investments including much of Ireland’s motorway network, 23 schools, the Dublin Convention centre as well as development of the courts and primary care health centres. He noted that there is a lot of interest by funders and the outlook for more PPPs in Ireland is good. The Ireland Strategic Investment Fund (ISIF) is another source of funds for Irish infrastructure. Donal Murphy, Head of Infrastructure and Credit Investments, explained the criteria that the ISIF use when deciding to invest; it must make a commercial return, have an economic impact and not displace other funds. A key sector they are interested in is fibre optic deployment, though they invest in a range of sectors including energy and transport infrastructure, housing and care centres. A European perspective on funding models for strategic infrastructure projects was provided by Tanguy Desrousseaux, from the European Investment Bank. The EIB funds projects across the EU and beyond across various sectors. From an Irish perspective they have provided finance for Dublin Port development, primary care centres, flood protection and educational investments in Trinity College and UCD. Further investments in Irish infrastructure are planned. The detailed sectoral impacts of some of these funding mechanisms were outlined in a series of presentations. Jim Curran, from the Health Service Executive, outlined the plans for investing in healthcare for better services, focusing on the delivery of primary care centres as well as investments in hospital facilities. Larry McEvoy, Technical Manager at the Department of Education and Skills, outlined some of the key education infrastructure projects that have been delivered and are in planning. Education is one of the largest recipients of capital funding with an allocation of €3.82bn planned between 2016 and 2021. Schools (both primary and secondary) account for nearly 80% of the funding and this in turn is in response to demographics, with projected enrolment at primary and secondary level continuing to increase up to 2025 at least. For example in 2011 enrolment at primary level was 510,000 children and this will increase to over 570,000 by 2018. Mr. McEvoy outlined the various milestones in the delivery of schools and noted that the building projects beyond 2016 would be announced by the Minister in November. Peter Walsh, Director for Capital Programmes, at Transport Infrastructure Ireland, discussed the importance of transport infrastructure and outlined the investment planned. Mr.Walsh identified the positive impacts of the development of the motorway network, in terms of journey time savings, better access to employment as well as a reduction in road casualties. He outlined the need for better public transport infrastructure around Dublin and some ideas on how to manage congestion on the M50. Current and planned roads projects were outlined. Transport Infrastructure Ireland have also been heavily involved in helping to devise regional transport strategies such as the Galway Transport Strategy. Bob Hanna, the Chief Technical Officer from the Department of Communications, Climate Action and Environment, outlined the importance of our energy networks to both the residential and commercial sector. He discussed National Energy Policy and in particular the New Energy White Paper published last December (2015). This White paper highlights the need to decarbonise our energy supply as well as ensuring security of supply and cost effective delivery. Details on the plan to upgrade Ireland’s water infrastructure was outlined by Elizabeth Arnett, Head of Corporate Affairs & Environmental Regulation, Irish Water. There is a seven year business plan (2014-2021) with key milestones and deliverables set out, including nobody on boil water notices, nobody to be at risk of water contamination as well as the ending of discharges of raw sewage into the sea. There was also an outline of proposed capital investment projects by county between 2007-2021. Within the Western Region, a spend of €356 million is envisaged over the period. Now that as a country we have emerged from recession, there can be consideration of what capital investment is required and what should be prioritised. The conference highlighted the different perspectives, the sectoral needs as well as funding mechanisms. Above all however, recognising the need to agree a National Planning Framework or Strategy to identify and direct where growth needs to be supported so as to optimise the country’s development is critical. The most recent plan for capital investment Building on Recovery: Infrastructure and Capital Investment 2016-2021 was published in September 2015. A mid-term review is planned next year. Work on the new regional economic and spatial strategies and the National Planning Framework is underway. A key theme from the conference is that the mid-term review and other decisions on capital spending need to be informed by the National Planning Framework and Regional strategies, both to give effect to them and to ensure that investment is not just sectorally driven. The WDC will be considering regional priorities and inputting into these regional and national processes. The regional economic and spatial strategies and the National Planning Framework should provide a strong framework as well as input into consideration of the key infrastructural priorities needed to optimise growth, economically and socially, for all citizens and spaces across Ireland. Without this framework, investment will be piecemeal and ad hoc, sectorally driven and relatively inefficient. https://www.wdc.ie/wp-content/uploads/transport-symbols-6876335-Pic-3.jpg 400 400 WDC https://www.wdc.ie/wp-content/uploads/wdc-567.png WDC2016-09-29 16:04:212016-09-29 16:04:40Infrastructure Priorities: What to Invest in and Where? Census 2016: Preliminary findings on housing stock and vacancy rates. What has been happening in the Western Region? A previous blog post Census 2016 Preliminary Results – What does it say about the Western Region? provided some headline figures on population and migration data in 2016 and changes since 2011. Here I examine two further aspects; housing stock and vacancy rates and examine what is happening at a Western Region and county level. In April 2016, the Western Region had a housing stock of 404,494, an increase of 0.8% or 3,183 on 2011. Nationally the increase was 0.9% over this period (18,981). These relatively small increases are not surprising following the economic crash and the very limited house building that has taken place since then. 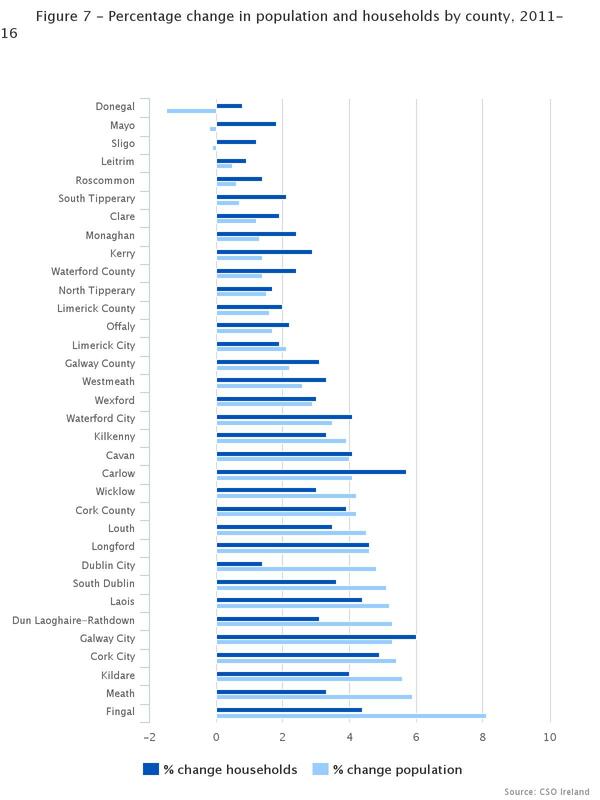 Within the Western Region there was an actual decline in housing stock in three of the counties, (see Table 1 below), Roscommon, -0.5% (-173), Sligo -0.2% (-51) and Leitrim -0.2% (-36), indicating some houses have been removed from the housing stock, though the data does not tell us whether these are ‘ghost estates’ or not. Though these are marginal changes, there are also negative declines in just a few other places, Dublin and Limerick cities and Longford. In contrast, within the Region, only Galway city records a significant increase in housing stock – 3.5% – the highest recorded increase across the State. Source: CSO, Census of Population 2011, Census of Population 2016, Preliminary Results. As the change in housing stock is so closely related to the most recent period of economic growth and decline, it is interesting to look at the figures over the 10 year period, 2006-2016. This period marks the time immediately before the peak of economic growth and growth in housing supply and the economic crash following this, culminating in the current period, marked by a return to economic growth. Between 2006 and 2016, there was an increase in housing stock of 16.4% in the Western Region and this compares to 14.3% nationally. Within the Region, some counties had a very significant increase in housing stock, Donegal (20.2%), Leitrim (19.1%) and Roscommon (16.9%), highlighting the particularly strong growth rates in the West. The evident contrast between the growth in supply in the earlier period and the limited growth and contraction in the latter period highlights the difference in housing activity over the periods. It is worth noting that even with the limited growth in housing stock in the latter period, the growth in the Western Region between 2006 and 2016 of 16.4% is still nearly than double the population growth in the Region over the same period – 8.6%. Looking at the period 2011-2016, the percentage change in both population and households by county is presented in Figure 7 below. While Donegal lost population (-1.5%) it still experienced a small increase in the number of households (0.8%). The vacancy rate measures the share of the housing stock in each county that is recorded as a vacant dwelling by the Census enumerators. The average vacancy rate in the Western Region in 2016 was 21.7%, marginally lower than in 2006 (22.8%). 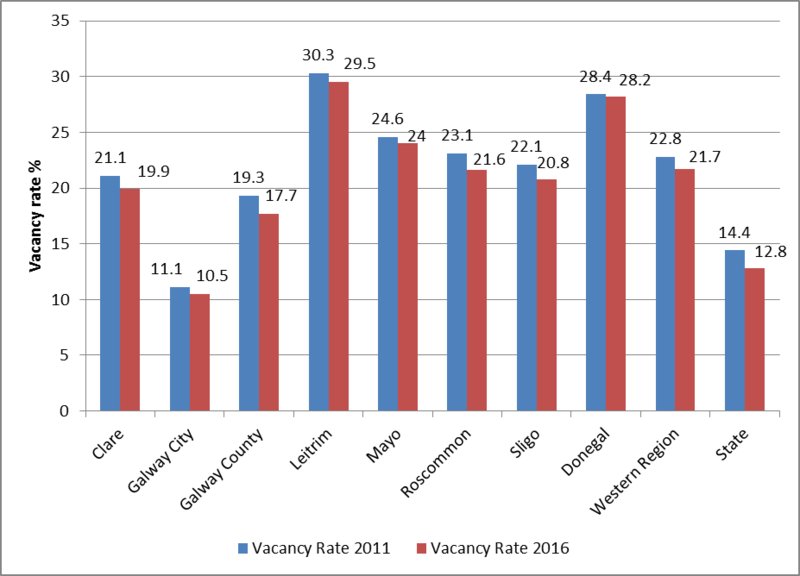 In total Leitrim (29.5%), Donegal (28.2%) and Mayo (24.0%) had the highest vacancy rates in the region, while Galway city (10.5%) had the lowest. All counties in the Western Region experienced a slight decrease in their vacancy rates between 2011 and 2016. Nationally, the average vacancy rate in 2016 was 19.9%, a decrease on the 2011 rate of 22.8%. At a national level, Leitrim and Donegal have the highest vacancy rates in the country and this was also the case in 2011. Figure 8 below shows the vacancy rate by county in 2016. These data, though preliminary highlight a couple of important themes. The first is that it is very clear that there are huge differences in housing stock and vacancy rates across the country. 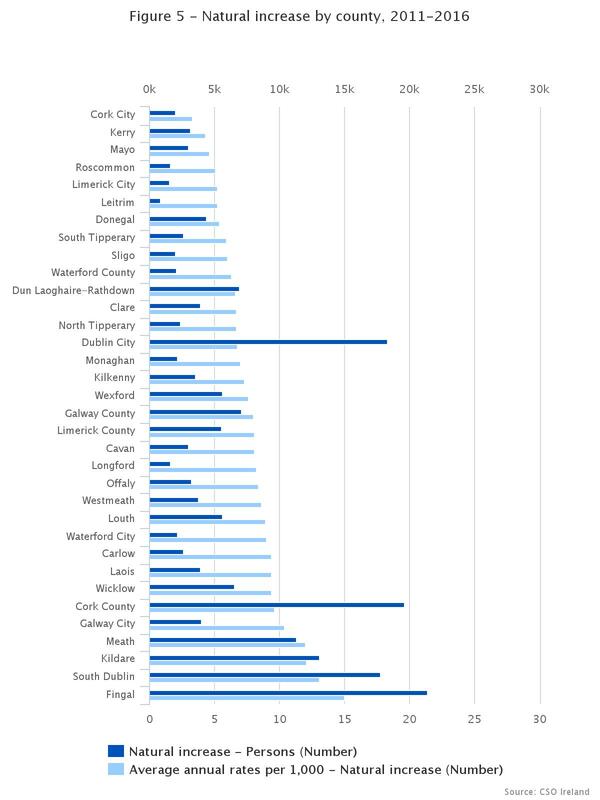 There are also differences within Regions, for example though most counties in the Western Region report negative or less than 1 % growth in housing stock, Galway city on the other hand had the highest growth in housing stock across the country. This analysis also highlights the value of a five yearly census. As Table 1 illustrates the difference evident in the last 5 years, compared to the previous 5 years is particularly evident in examining the changes to the hosing stock. https://www.wdc.ie/wp-content/uploads/Prelim_results_infographic_Final_medium.png 525 898 WDC https://www.wdc.ie/wp-content/uploads/wdc-567.png WDC2016-09-07 15:30:482016-09-07 15:30:48Census 2016: Preliminary findings on housing stock and vacancy rates. What has been happening in the Western Region? Census 2016 Preliminary Results – What does it say about the Western Region? The headline figures from the preliminary Census 2016 figures show a population that is growing, nationally by 3.7% over the last 5 years. However it is not evenly spread and it is clear that much of the growth is on the East coast and in urban centres. Nationally the population is now 4.75 million, an increase of 3.7% on the 2011 figure of 4.58 million. The Western Region’s population grew at a much slower rate, by just 0.9% over the period, to 828,124 – amounting to 7,244 more persons than in 2011. Where is this growth occurring? The Map below highlights the spatial distribution of population growth. 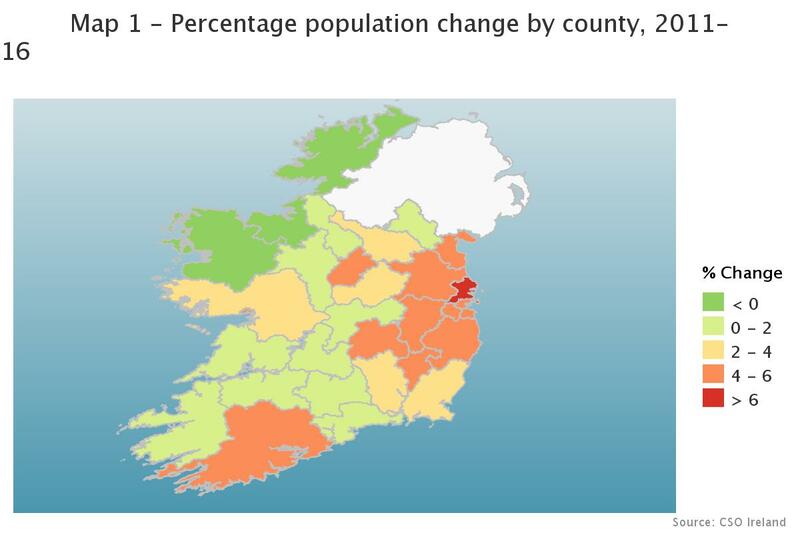 While most counties experienced some level of population growth just three counties, all in the Western Region, witnessed population decline over the five years, namely Donegal (-1.5%), Mayo (-0.2%) and Sligo (-0.1%). From a Western Region perspective, the other four counties of the Western Region all recorded population increases over the period; Clare (+1.2%), Leitrim (+0.5%), Roscommon (+0.6%), Galway county (+2.2%), Galway city (5.3%). It is clear from the map that the particularly high growth rates, in excess of 4% are all, apart from Cork and Longford, occurring on the East coast. Net migration and natural increases are the two components of population change. Migration, especially in an Irish context can vary a lot and is heavily influenced by the rate of economic growth. Nationally net migration over the past 5 years is estimated at -28,558. This compares with net inward migration of 115,800 over the previous five years from 2006-2011. The migration figures include international migration as well as migration within Ireland. It is clear that a key driver for migratory flows is employment opportunity. As the map below illustrates, most counties – coloured red and orange, experienced net outward migration. 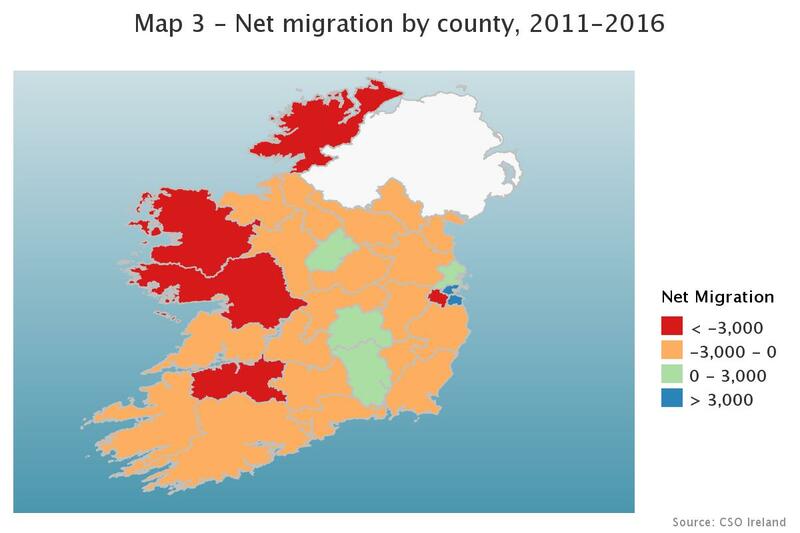 Dublin and Cork city along with Kilkenny, Laois and Longford experienced net inward migration. It is most significant in parts of Dublin. All other counties experienced net outward migration and this is particularly stark on the West coast, in Donegal (-6,731), Mayo (-3,246), Galway (-3,168) and Limerick. The natural increase (births minus deaths) is the other component of population growth or decline. While natural increases are evident across the country, it ranges from an annual average rate of 3.3 per 1,000 in Cork city to a rate of 15 per 1,000 in Fingal. This range is evident in the chart below. 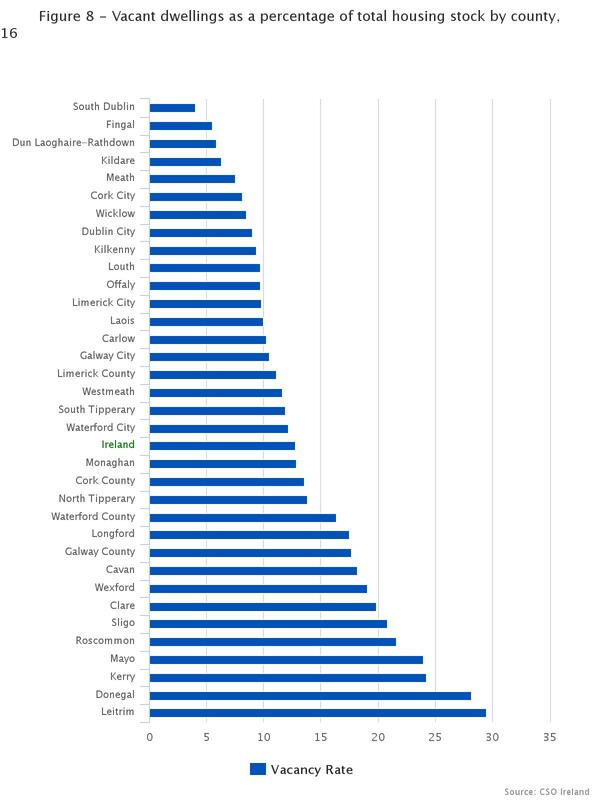 From a Western Region perspective, all counties except Galway city have an annual average rate less than the state average which is 8.5 (on the chart between Offaly and Westmeath). So what are the policy implications? There are many implications across a whole range of policy areas. The greater detail which will be available from the detailed Census outputs later in the year will help inform specific policy areas. It is clear that, so far, the preliminary results from Census 2016 highlight the need for a new spatial plan which can help direct where population and economic growth should occur. Economic and population growth need to be supported to ensure optimum growth across all regions. https://www.wdc.ie/wp-content/uploads/Prelim_results_infographic_Final_medium.png 525 898 WDC https://www.wdc.ie/wp-content/uploads/wdc-567.png WDC2016-07-14 16:57:532016-09-07 15:47:46Census 2016 Preliminary Results – What does it say about the Western Region? Our last blog post examined the role that sectors play in regional GVA. Sectors also have a huge impact on the pattern of jobs growth. Following on from our April WDC Insights publication ‘Jobs Recovery in the Western Region’, the WDC has just published new analysis examining the role that sectors have played in recent jobs trends. ‘Impact of Sectors on Western Region’s Jobs Recovery’ examines some of the causes for the region’s slower jobs recovery. There is greater concentration of employment in a few sectors in the Western Region. 62.2% of jobs in the region are in its top five sectors (Industry, Health, Wholesale & Retail, Agriculture and Education) compared with 53.6% in the rest of the state. Greater diversity in employment across sectors is an important aspect of regional resilience and growth. The region has higher shares working in the traditional sectors (Agriculture, Construction, Industry) and also Public Services (Health, Education, Public Admin) than in the rest of the state (Fig. 1). At the same time, there are lower shares employed in Locally Traded (Retail, Accommodation, Transport) and Knowledge (ICT, Finance, Professional) Services. For Locally Traded Services, as these rely on domestic demand, lower incomes in the region compared with much of the rest of the state may be a factor in this. It also helps to explain the region’s higher youth unemployment as these are areas (shops, bars) where young people often find work. The high-value Knowledge Services sectors is where the region lags the rest of the state most significantly. These are seen as key sectors for growth and their poor performance is a cause for concern. Manufacturing plays a more important role in the region’s employment, accounting for 15.6% of jobs compared with 12.2% in the rest of the state. Between 2012 and 2015 growth in manufacturing jobs in the Western Region was more than twice that as in rest of state – 8.3% v 3.4% (Fig. 2). The region’s manufacturing strength has been a key factor in the West’s relatively strong recovery in GVA. Manufacturing is a key regional strength. Between 2012 and 2015 there was jobs decline in the three market services sectors (Administration and Other, Locally Traded and Knowledge) in the Western Region, while they grew elsewhere in the state (Fig. 2). This is the main reason for the Western Region’s slower jobs recovery. Similar to the rest of the state, Agriculture and Construction saw the largest increases in job numbers in the Western Region, driven by strong agri-food exports and a resurgence in building activity. This WDC Insights shows that slower jobs recovery in the Western Region is mainly due to contraction in market services sectors, in contrast with growth elsewhere. In every year since 2011, the numbers working in the Western Region in both Knowledge Services and in Administration and Other Services has declined. This was during a time of recovery nationally. While the region’s strong manufacturing base and Public Services employment have compensated to some extent, it has not been enough to allow the region to enjoy a similar rate of jobs recovery as elsewhere. Optimising growth across all sectors, and addressing challenges in the market services sectors in particular, will be required for a healthier and more resilient regional labour market. 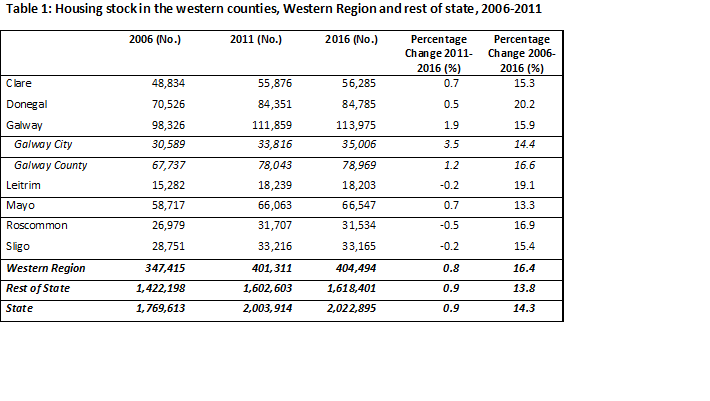 Source: All data taken from a special run of the CSO’s Quarterly National Household Survey, Quarter 1 2012-2015 for the seven county Western Region. For the week that’s in it, we thought we’d turn our attention to 1916. The CSO recently launched a very interesting resource that’s well worth investigating Life in 1916 Ireland: Stories from statistics that highlights just how much life has changed over the past century. A lot of the data is for Ireland as a whole, but there’s county information on many topics. Understandably much of the analysis focuses on living conditions for people in Dublin city at the time of the 1916 Rising, especially those living in the tenements, but some very interesting patterns for the West also emerge. The past century has seen a fundamental shift in Ireland’s population towards the East coast, with Leinster’s population more than doubling (up 116%). Munster meanwhile had a 20% increase. In contrast, both Connacht and the counties of Ulster in the Republic both experienced an 11% fall in their population over the past 100 years. At a county level, all counties of the Western Region, except Galway and Clare, had a fall in population ranging from -50% in Leitrim to -4% in Donegal (Fig. 1). Within the region, the population tended to shift southwards. There were 176,659 housing units in the Western Region in 1911. There was a 69% increase over the following century, but this increase is dwarfed by the 222% increase in housing units in the Rest of the State, clearly a consequence of the shifting population patterns. The region was also characterised by fewer ‘big houses’ with less than 5% of all houses having 10 rooms or more compared with 11.5% in the Rest of the State. Mayo, Leitrim and Roscommon had the lowest shares of large houses. At the other end of the scale, there were 10,080 one room dwellings in the Western Region in 1911. If we specifically consider one room dwellings which housed three or more people (Fig. 2), the impact of Dublin’s tenements is clear. Over half of one room dwellings in the city had three or more people. For the Western Region it was quite a mixed picture with the large rural counties of Donegal and Mayo having the next highest shares after Dublin, while Roscommon and Leitrim had among the lowest. Birth rates were a key factor here, as Roscommon (18.1 per 1,000 population) and Leitrim (19.2) had some of the lowest birth rates in the country in 1916, while Mayo (21.8) and Donegal (21.2) had among the highest. The prevalence of large numbers living in one room dwellings in Donegal and Mayo could be linked to the phenomenon of seasonal agricultural workers which was strongest in these counties. In 1914, approximately 13,000 people migrated to Britain for seasonal agricultural work. The county of origin for 7,246 of these migrants is known and Mayo and Donegal accounted for over 80% of the migrants (4,282 and 1,640 respectively). As these workers would be absent from the home for long periods, the actual number of people living in some of these one room dwellings during these periods would have been lower. The CSO quotes the Department of Agriculture & Technical Instruction reporting that labourers “…save usually from half to three-quarters of their earnings, and some return home with as much as £20 saved in the season.” This report also noted that 97% of migrants from Donegal went to Scotland while 93% of the migrants from Mayo went to England and Wales. This pattern of seasonal agricultural work was also likely a factor in these counties having the highest rates of illiteracy in the country with Donegal (16.8%), Galway (15.3%) and Mayo (14.6%) having the highest (Fig. 3). While the West may have had higher illiteracy rates, one area where it performed well was in infant mortality. Ireland’s infant mortality rate in 1916 was 81.3 i.e., for every 1,000 babies born during 1916, 81 died before they reached twelve months of age. The infant mortality rate was truly shocking in Dublin City at 153.5, followed by Dublin County at 102.2 and Limerick at 101.1 (Fig. 4). Counties in the Western Region had the lowest rates of infant mortality with a rate of 34.6 in Roscommon, 45.9 in Leitrim and 51.4 in Mayo. The CSO notes it is likely that higher population densities in urban areas (such as in the tenements in Dublin City) contributed to the spread of diseases. While poverty was widespread in both urban and rural areas, there would have been greater access to fresh air and better quality food in rural areas. While we’ve highlighted some of the most striking figures showing what life was like in the West in 1916, there’s a lot more you can discover in this fascinating resource.